One of the primary concerns with working against the LAM evidence is that the furnace construction is a simple clay and sand mix. Our own past experience with this material has almost always resulted in heavy cracking to the furnace walls. (Although it should be noted that others, especially Sauder & Williams do NOT have that problem!) This was certainly the case in this experiment. This smelt was also predicted to have lower yields than our usual. First, the ore analog mix used thought to be part of the reason. The analog used here was a blend of Spanish Red oxide and Hematite grit. The main reason that low yields are predicted for these smelts is the method of air delivery - use of the human powered Norse double bag bellows. The air volume available is based on a theoretical delivery, the there has proved to be large variation in delivery between individual operators. 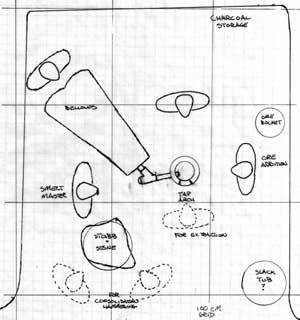 The physical layout of the equipment is based not only on the archaeology, but also how that evidence has been interpreted by the working smelt team based on its past experience. With the remains of the smelter base placed slightly to one side of centre, the bellows has been positioned to the wider side (the left as seen here). Use of a leather Y coupling allows for just enough room to permit clearing of the tuyere as required. The evidence suggests a tap arch towards the open front of the structure. The large pit to the front left is interpreted here as the stable mounting of a wooden stub to hold a large stone anvil for the consolidation step. Through some luck, a large stone with relatively flat surfaces had been found that was fairly close to that found at LAM to serve as this anvil. The pile of charcoal was placed to the right rear, and ore addition to the right centre. A slack tub placed to the right front corner cools working tools close to hand. As with other furnaces in the Vinland series, the walls were built up of a simple clay and beach sand mix, at roughly 50 / 50. The starting interior diameter was 23 cm (9 inches), produced by using a metal form wrapped in newspaper. Wall thickness initially was roughly 5 cm. The furnace was constructed on top of a circle of fine white silica sand (to help distinguish this experiment from earlier ones). As each course of clay was built up, the form would be removed, and the interior filled with a dry mix of wood ash and beach sand (also a 50 / 50 mix). This helped to stabilize the structure, speed drying of the clay, and allow the form to be raised for the next clay course. First course completed with packing added - note the shape is cylindrical at this point. As the construction continued, it became apparent that the first batch of clay had been mixed up a bit too wet. Despite considerable care to prevent downwards force as the next two upper courses were applied, the base level started to slump under the weight. The end result of this was not only a thickening of the lower wall, but also a considerable belling outwards. The end result was a pronounced 'pot belly' shape instead of the normal cylindrical or tapered shaft. This increased the diameter of the smelter to closer to 28 cm (11 inches) at tuyere level. Although the initial build was to roughly 65 cm, the slumping reduced this height to closer to 60 cm. The next day an extra layer was added to the top of the walls to extend these to roughly 68 cm (26 1/2 inches). Measurements of the completed furnace. Cut out Tap Arch, showing increase in wall thickness at base to about 10 cm - due to slumping. A small tap arch was cut into the base, 20 cm wide by 14 cm tall. This was separated from the parent wall with a thin layer of birch bark to keep it from re-sealing. The tuyere was forged from mild steel pipe (standard schedule 40). A taper was created over roughly the last 10 cm, reducing the starting interior diameter from 3.5 cm down to 2 cm at the tip. A series of three sewn leather tubes, held tightly in place with thongs, jointed the tuyere to the bellows tube. The effect of these leather couplings was two fold. First their flexibility reduced any vibration or movement from the working of the bellows from being transmitted to the tuyere mounted in the fragile smelter wall. The second effect was to prevent heat absorbed by the metal pipe from being radiated back up the system. In the centre of the couplings was a leather Y tube, the last branch filled with a tapered wooden plug. Removing this plug allowed to probe down through the tuyere to clear any blockages as might be required. Overall this system proves quite stable and effective. The tuyere itself was set up as has been proven to be the ideal through past experiments. It angled downwards at 22 1/2 degrees, protruding into the smelter 5 cm proud of the inner wall. 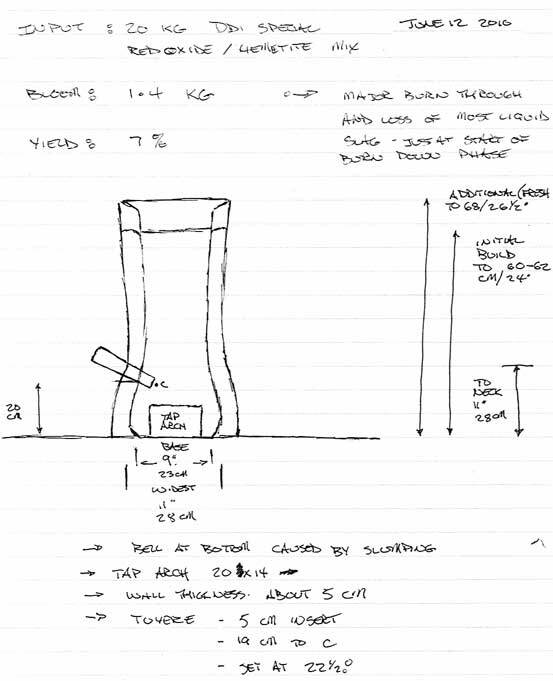 The centre of the tip was positioned 19 cm above the ground level base of the furnace. View of the interior after the initial drying fire. Note large crack extending down to the right of the tuyere. The night before the smelt, the normal small drying fire of wood splints was started inside the furnace. Four to six pieces of hardwood, split down to roughly thumb diameter, were added at a time. The drying process was conducted with primarily natural draft caused by slightly pulling back the tap arch block. The bellows was only used when the fire was in danger of completely going out. The process heated through to the exterior, making it 'almost too warm to hold your hand to'. 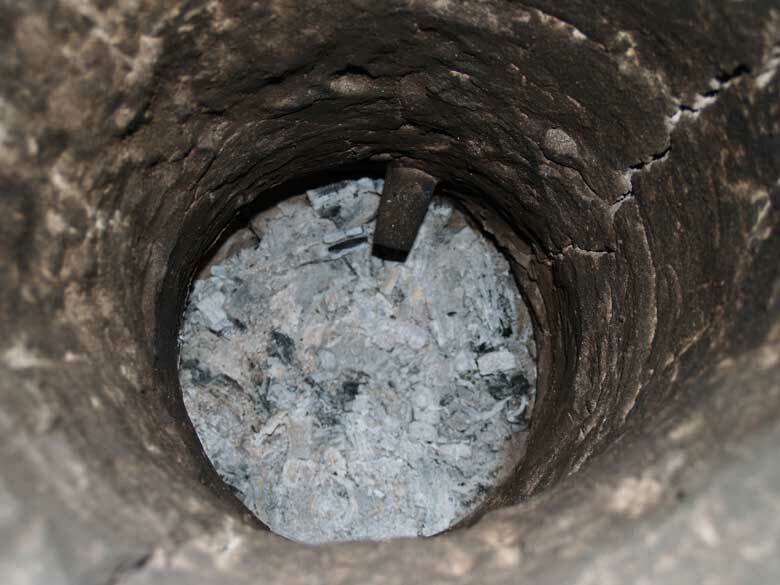 After about three hours, a metal cap was placed over the top of the furnace, and the coals inside were allowed to burn down to ash (as seen in the image above, taken the next morning). It was discovered there were several large cracks which ran from the top of the furnace right down to the base. The largest of these was opened up to about 1 cm at the top. 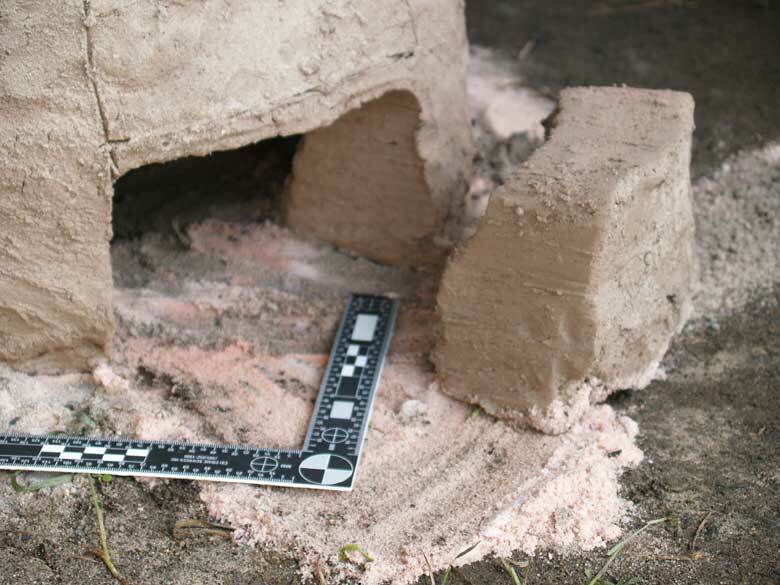 As the initial pre-heat fire of wood splints was started, an attempt was made to use what little softened clay remaining on hand to wedge shut these cracks. 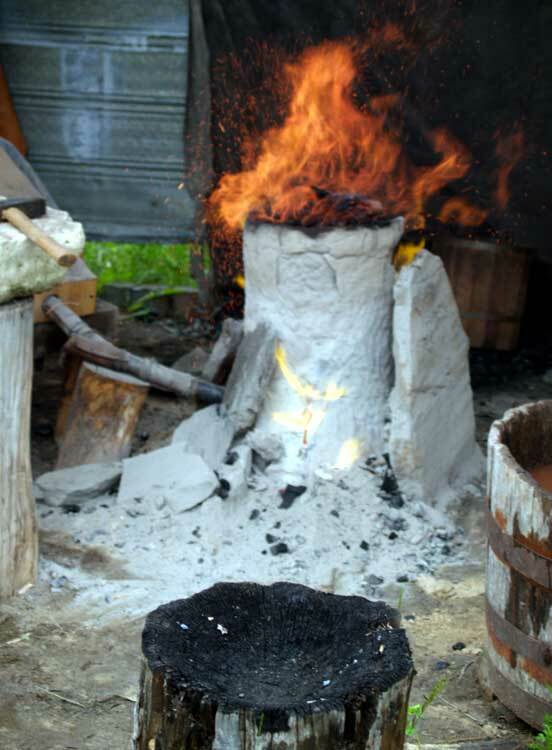 As the damp clay was sure to shrink and crack itself, it was only expected to reduce, but not eliminate, the effects the large cracks would have on the progress of the smelt. At the start of the pre-heat, stone slabs packed with ash and sand mix. As with other furnaces in the Vinland series, the clay inner liner was surrounded by a series of flat stone slabs. The clay core of the furnace would certainly have endured a single firing event without any additional support. The primarily function of the slaps is actually to hold a layer of packing material in place, the same 50/50 mix of wood ash and sand used during construction. On exposure to the high temperatures of the smelter, this mix actually will form a simple glass, which also will help to plug cracks. If the holes become over large, the packing will run into the inside of the smelter, which can result in excessive slag formation. This itself can cause problems with managing the smelt. As the first load of rough charcoal was added, there was considerable problems with explosive spalling, especially at the outer top areas of the clay walls. New cracks developed, existing ones widened. The conduct of the smelt was based entirely on past experience, the look and sound of the working smelter, rather than objective measurements of time and temperature. All the workers had past bellows experience, both at the smelter and as working blacksmiths. This allowed there to be a relatively constant supply of air over the entire progress of the smelt. This despite switching operators every 10 minutes or so, and individual fatigue over the roughly four hours of the smelt. Consistency of air delivery was based mainly on sound, as individual operators had differing styles of stroke. Delivery produced is a combination of length of the stroke, frequency of the stroke, plus amount of force used for the stroke. For most operators, one stroke is required each second, roughly the rhythm of a healthy heart's beat. A wooden scoop had been made of green birch wood, of a size to hold about a 'double handful' of ore. Earlier measurements of the Dark Dirt analog showed that the average weight of a slightly rounded scoop full was 540 gms. Charcoal was added by 'a standard bucket'. A wooden bucket had been marked to contain the same volume as our standard (modern) bucket, which contains about 1700 gms of sized, dry charcoal. Besides attempting to maintain a constant air flow, the only other control was the distribution of ore additions related to charcoal consumed. Again the pattern used was based on experience gained from past smelts. The entire interior of the smelter to come up to full temperature, when the glowing orange of ignited charcoal climbs to a level about 40 - 45 cm above the tuyere (about 7 cm below the top). At this point ore is added, distributed evenly through each bucket load of charcoal. The first four additions of ore consisted of single scoop measures per bucket of charcoal. The next three charcoal measures included 2 scoops. The next two additions included 3 scoops. The last bucket included the remaining ore, just over 3 scoops. Late in the smelt. Gases escaping from the widening cracks are evident. The stone slabs have been re-positioned several times in an attempt to plug the worst of the gaps. It only proved necessary to tap liquid slag once during the main sequence. This was roughly 2/3 the way through the process. 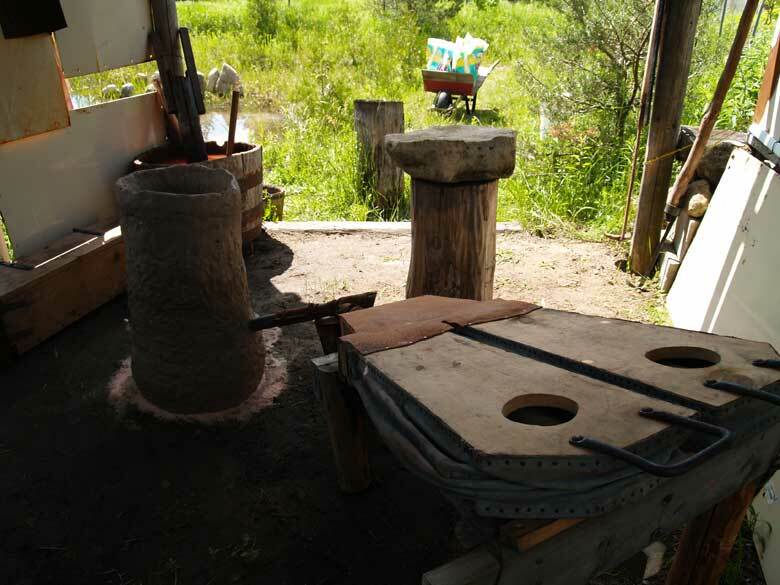 The tapping was done through the front arch, moving the block away and punching a small hole through the slag bowl on the side away from the tuyere. Generally the tuyere worked cleanly, clearing slag obstructions was only required a couple of times. The impression was that the higher pressure pulses of air produced by the direct stoke with the Norse double bag bellows was assisting to keep the tuyere clear. It had been expected with the various cracks that developed that the furnace would self tap. This proved not to be the case through the bulk of the smelt. A dramatic event near the end of the main sequence was to alter the course of the smelt. The last charge of ore, about 3 1/2 scoops, had been added. One last full bucket of charcoal had been added to cover this, and the burn down had begun. The top level of charcoal had dropped down about 10 cm. At this point the last ore addition would have fallen to roughly just above tuyere level. Suddenly, a massive pour of slag vented out of the crack just to the side of the tuyere (towards the rear, away from the tap arch). There was a bit of a mad scramble in an attempt to halt this flow. (I was working the public rope line outside the smelter when this happened). In the end approximately a litre or more of liquid slag was lost. The first, and likely most important result was a considerable drop in internal temperature within the smelter. As soon as the iron rich slag had cooled enough to allow it to be picked up, pieces were returned back into the smelter, along with about another half bucket of charcoal. The hope was that this material would melt, and some of the iron it contained would be deposited to the developing bloom. This certainly proved not the case, as the furnace had lost enough heat that those pieces never did melt. The regular burn down continued, to a point there was perhaps 10 - 15 cm of charcoal remaining above the tuyere / slag bowl level. 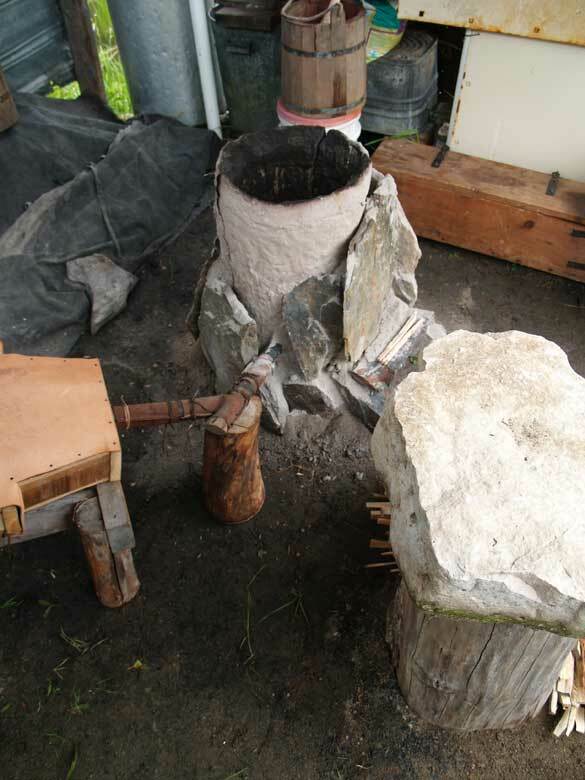 The normal top extraction method was used : reducing air flow, scooping out the remaining charcoal to uncover the top of the slag bath, hammering the top of the bloom in place with the wooden log 'thumper'. The bloom with its usual loose coating of 'mother' was pulled free easily with the bloom hook, then grabbed with the bloom tongs and moved to the stone anvil. Working the bloom, near the end of the consolidation step. Note the pile of loose 'mother' scattered on the stone anvil. As the bloom was pulled from the smelter, it was immediately obvious that the mass was significantly less that what has been come to be expected from earlier smelts. Our normal practice is to lay the bloom directly on the top of a wooden stub, rather than employing any kind of anvil. Lack of experience working on a stone anvil caused the incorrect assumption to be made of the blooms character. The dull 'whack' sound on each hammer stroke was so like the sound of hitting cast iron, this was pronounced to be the quality. In retrospect, the mass was also considerably colder than is normal, even as it was pulled from the furnace. In the past the newly extracted bloom is closer to a 'bright yellow' welding heat. In this case the metal was a best a 'bright orange'. As it was hammered, it was just not hot enough to be welded up, but instead was more mechanically compressed. The result was a brick shape, containing a lot of cracks. Partially compressed bloom, what was likely the upper face when inside the furnace. The mark from the grinding test can be seen. 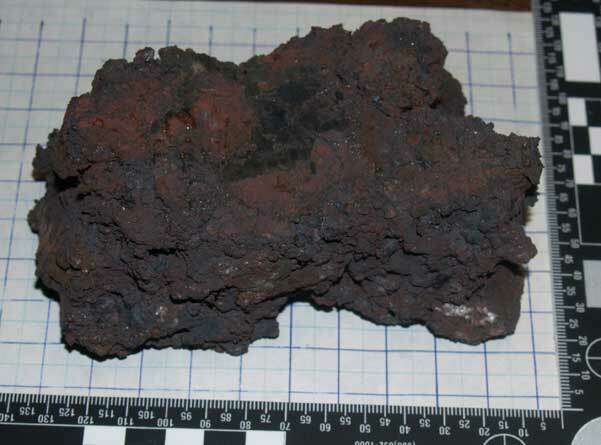 The total size was 12 x 6 x 4.5 cm, weight at 1400 gm, with a second small irregular piece at about 150 gm. With a total starting weight of ore at 20 kg, that equals a yield of only 8%. Far less than expected! A later spark test on the centre face of the brick suggests a nice low carbon iron. Kevin Smith reminded me (again) of one of the truisms of archaeology : that 'absence of evidence is not evidence of absence'.
" In other words, without seeing the original, actual samples from L'Anse aux Meadows, I would not put much trust in reconstructing a tapered wall thickness from 10 cm (base) to 5 cm (top)...unless the actual original pieces from L'Anse aux Meadows are so well preserved that it's clear that all of them have well-preserved exterior and interior surfaces. If they do not, then what the L'Anse aux Meadows published furnace wall fragments are actually telling you is ONLY that the furnace walls were *at least 10 cm thick*. I do not think you can assume that they were any thinner unless they do have furnace wall fragments just 5 cm thick with well-preserved and distinct finished surfaces on both sides. " " You need to make sure you're using a good clay, it needs to be heavily grogged with sand or clay grog, it needs to be mixed properly (not too much water), it needs to be worked and kneaded (wedged), and it should rest before you use it.
" The organic fibers are nice, but if you can't use them, just increase the sand or grog so that your clay content stays low. The sand doesn't change size much when it gets hot, the clay does. " In retrospect, the use of unknown clay, a choice caused by simple time pressures and supply problems, appears to be the main cause of the construction problems with this furnace itself. This statement based on the fact that this there were three other furnaces constructed earlier on the same layout, and the methods employed were those fairly standard for the building of many others. With the new clay the only major variable, this certainly appears to be the source. My plan for the actual LAM demonstration smelt is to have enough of of standard clay on hand for the build. There remains the possibility of acquiring enough of the local clay to build the furnace of. This however would then add a second level to the experiment itself. Some better understanding needs to be acquired on the effects of various mixtures of sand and clay. I had originally thought that mixing 50 % sand was a generous amount, but the advice given based on the direct experiences of others suggests this is not the case. Without definite knowledge of the exact mixtures utilized at LAM originally, this all remains guess work at best. 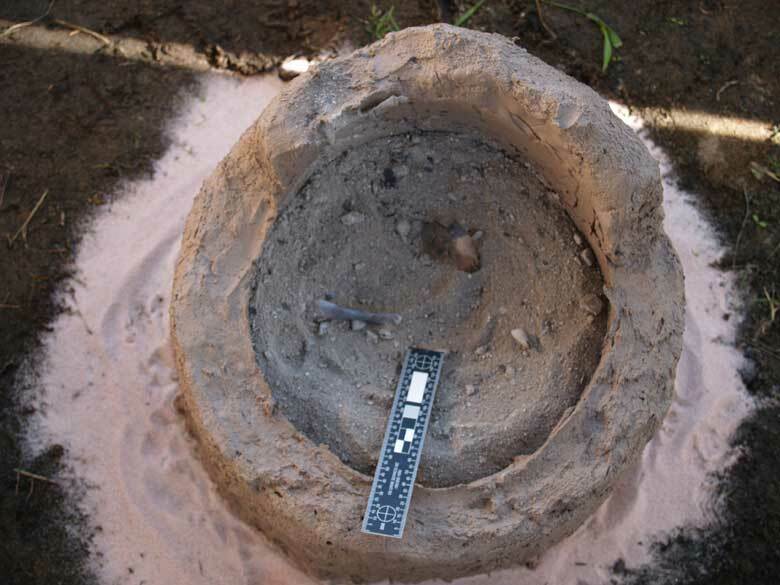 The furnace used for Vinland 4 did experience hardly any interior wall erosion, normally a significant concern on at least the first firing of such small clay wall furnaces. A number of others have explained that increasing sand or adding grog normally helps *prevent* cracking. Generally this was linked to problems during the actual firing cycle of the furnace, which was not the case here. Since the cracking developed during the initial drying, some modification of that method should be considered. The exact composition of the ore used was not recorded. It was however a mixture of our DD1 (red) plus some amount of granular hematite. The straight DD1 (at 45% Fe) has proven to produce lower yields (in the range of 15%) in the past, so perhaps the low yield on this experiment should have not been so unexpected. The addition of any amount of hematite (at 68% Fe) could have only served to enrich this ore. There has been some indication that it may be possible to utilize locally gathered primary bog ore for the LAM demonstration smelt. My plan is to bring enough of the previously tested DD2 (black) analog. 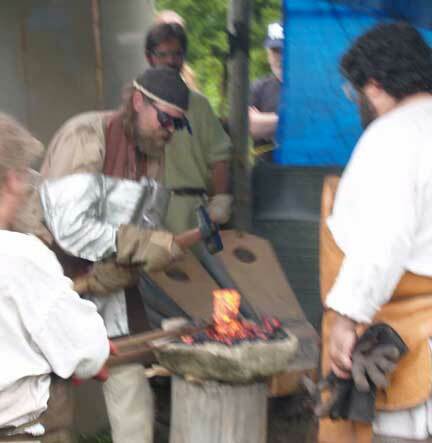 Switching to an unknown and untested ore is most likely to modify the entire theme of the LAM smelt from 'practical demonstration' into 'experimental archaeology'. Consultation with Parks Canada would certainly be called for before switching the focus. The other large variable most likely to impact bloom formation is the air system. As has been indicated, the working volume of the Norse type smelting bellows may not have been adequate to produce enough air, considering the expansion of the slumping furnace from the planned 22 cm to 28 cm internal diameter. Low air almost always equals low yields and less dense blooms, both of which occurred in this experiment. The other use of the same human powered system (Vinland 3) also resulted in lower yields than expected, despite the use of a significantly higher iron content ore. It is hoped that with more practice (and a solid working team) fluctuations in delivery (thus temperatures) can be leveled out.